Are you ready for fabulous Lashes? Eyelash extensions are fabulous! With new synthetic fiber technology, your individual eyelashes are paired with a lash extension using a bonding agent, giving you longer fuller eyelashes. Each person will recieve a fully customized look based on a thorough consultation. The synthetic lashes are applied to your actual lashes, so this is a semi-permanent/temporary effect. Your eyelashes shed like all the hair on your body so as your natural lashes are replaced the effect of the extensions will lessen over time. 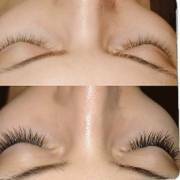 Typically lash extensions will last about four to six weeks. This is where touch-ups come in. Touch up appointments are necessary to have the desired look indefinitely. Although most clients are just plain tired of having to wear mascara and want a natural everyday lash extension look to save on time - eyelash extensions are a favorite cosmetic procedure before important events, such as proms, weddings, reunions or other special occasions. Application techniques can give a subtle enhancement or you can go all out and have glitter or exotic color accents. Synthetic eyelash extensions are a major advancement to eyelash strips and cluster lashes without the mess or heavy feel on your eyelids. When applied correctly they look and feel so natural its difficult to tell they are not your own. For a free consultation on the right lash extensions for you call Tina at 909-489-2436.